Okay. I admit it. Sometimes . . . I decide to read a book just because I love the cover so much. I'm sure I read the summary of A Corner of White before I started it. I think I even read a review of it. But really, the only reason I decided to read it was because of the cover. Those red boots. The sparkles in the sky. That brilliant white card. The flying umbrella (which, incidentally, is still a mystery to me even after finishing the book). It was even one of those books I checked out and had to return to the library before I read it, and I still went to the effort to check it out again just because I wanted to see what was behind that cover. And what I found surprised me. Not necessarily in a bad way. Not necessarily in a good way either. Just . . . different. Surprising. First there's Madeleine. She and her mom recently moved to Cambridge, England, but Madeleine misses her old life, which was filled with adventure and spontaneity and glamor. Now she is participating in a strange homeschooling arrangement with her two friends, Jack and Belle. Then there's Elliot. He is not from Cambridge. He lives in Bonfire, a remote village in the Kingdom of Cello. A year ago, his father, uncle, and the high school physics teacher were attacked by a Purple. His uncle was killed, and the other two disappeared. Elliot knows the chances of them still being alive are miniscule, but he is determined to make every effort to find them, just in case. The two worlds are separate. Completely unconnected. Until one morning, Madeleine walks past a broken parking meter and sees a small corner of white paper sticking out. She reads the cryptic note--"Help me! I am being held against my will!" --and, thinking it is a joke, decides to write back (and of course Elliot is the one who finds it). This sets off a correspondence between Madeleine (who knows nothing about Cello and thinks she is exchanging letters with someone who may not be completely sane) and Elliot (who is well aware of Cello's break with The World hundreds of years before and realizes he has discovered one of the infamous "cracks" between the two worlds). 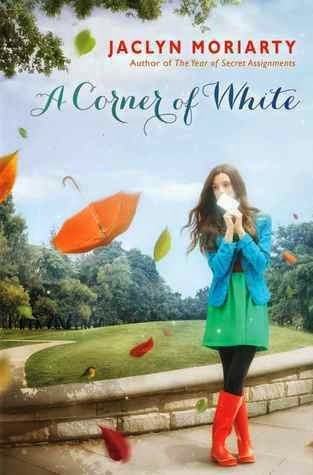 Besides the cover, there actually was another reason why I wanted to read A Corner of White. 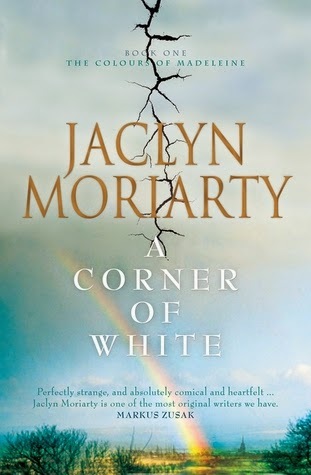 Jaclyn Moriarty is a sister to Liane Moriarty (author of What Alice Forgot and The Husband's Secret). You might recall that I adore Liane Moriarty's writing. I was curious to see how Jaclyn's writing compared, especially since her books are geared toward young adults, and I was hoping they'd maybe be a little cleaner than Liane's adult novels. Their two styles are completely different. I remember I was smitten with Liane's writing from the very first page. With this book, I honestly spent the first hundred pages (at least) wondering what Jaclyn was smoking when she wrote it. There were horoscopes and auras and Colors and ditzy princesses. Every character acted just a little too weird for comfort. It was bizarre. That's the best word for it. It's a wonder I actually finished it. And I mean that. I considered sending it back to the library numerous times because I was so frustrated with the insane amount of confusion I was feeling. But . . . I pushed my way through it (which isn't something you're supposed to say about a "light" read). And my persistent benefit of the doubt paid off. The ending was stellar. It was somewhere in the last 100 pages that I realized, Hey! I'm actually enjoying this! When I finally closed the book after reading the last page, my opinion of Jaclyn Moriarty had changed. I was awed by her creativity and surprised with the direction she took the story. I won't say the ending completely redeemed the beginning because it didn't; 100 pages is too much of a commitment to expect from readers without acknowledging their efforts. BUT, it was comforting to see that there was a plan behind the madness. And by the end I no longer felt like I was going crazy. Always a good thing. Putting all that aside however, I still have one complaint: Madeleine was too young for this story. For the entire first half, I pictured her as being fifteen or sixteen. Elliot is fifteen, so I assumed Madeleine was a similar age. Plus, her maturity, attitude, and action all seemed to represent a character in her mid-teens. Then, somewhere along the way, it comes out that she is only thirteen. This was a huge mental shift for me, and I never completely came to terms with it. Maybe I would have been okay with it if I'd known it from the beginning (and maybe it was mentioned somewhere early on, and I just missed it). Regardless, I still think it feels more like a young adult than a middle grade novel, so Madeleine's age is a problem. This is the first book in a trilogy (is it absolutely impossible for young adult authors to write standalone novels anymore? Just asking . . . ), and I can't decide if I'm going to continue reading or not. The ending left me in a good mood: full of questions but also lots of answers. And yet, I can't completely forgive the beginning and don't know if I'm willing to invest so much time in something I might only enjoy half of. And I know I need to decide soon, or I'll have forgotten everything, and I'm not really committed enough to reread this one before reading the next one. It's definitely more dramatic than the American one, but I think it shows a different side of the story, which I like. I loved this...and I don't like YA fantasy per se -- I read the 2nd and there's a definite "oh my I wasn't expecting that!" at the end. Will finish the series. You know what my vote is ;) and a thank you letter will be coming in the mail soon! Summer Goals . . . For Kids!